Stick-On Body jewellery colour Body Jewels. 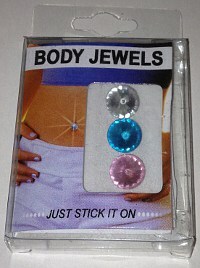 Pack includes 3 pieces 'Just Stick it On' assorted colour 8mm round cut sticky back Body Jewels. Excellent self adhesive Body Gems Jewels in bright colours. Supplied in Pack of 3 stick on round cut crystal jewels for use as naval belly body jewellery. Simply STICK ON no need for piercing.